* Professor of El Colegio de Sonora (Mexico), Center for Studies of North America, acova@colson.edu.mx. With mounting pressures from consumers and stricter fuel efficiency and emissions regulations, as the financial crisis proceeded and bailed-out U.S. firms were joined in hardship by other automaker icons, questions about the future of the main producers soared. one of them relates to the product policy firms will deploy to overcome the crisis. This essay addresses this question, focusing on product and market strategies firms working in Mexico have put in place in recent years. Drawing on productive models theory, the author shows that most corporations, particularly U.S. firms, are putting forward strategies that reaffirm Mexico as a strategic asset in the North American region. Key words: auto industry crisis, product and market strategies, North American firms, regional market, fuel efficiency demands. En un contexto de presiones crecientes por parte de los consumidores, y de regulaciones más estrictas sobre eficiencia energética y emisiones; y en tanto la crisis financiera continuaba y a las firmas estadunidenses ya rescatadas se les unían otros iconos automotrices, se dispararon las preguntas sobre el futuro de los productores principales. una de ellas se relaciona con qué políticas de producto utilizarán las firmas para superar la crisis. Este artículo aborda dicha cuestión, enfocándose en las estrategias de producto y de mercado que han instrumentado en años recientes las compañías que trabajan en México. utilizando la teoría de los modelos productivos, el autor muestra cómo la mayoría de las corporaciones, particularmente las estadunidenses, proponen estrategias que reafirman a México como un recurso estratégico en la región de Norteamérica. Palabras clave: crisis de la industria automotriz, estrategias de mercado y de producto, firmas norteamericanas, mercado regional, demandas de eficiencia energética. Long before the crisis broke out in summer 2008, most large automakers had been facing mounting hardships. Ford, GM, and Chrysler alone, the so-called American Big Three, were losing billions of dollars1 and a big chunk of worldwide market share, dropping from 18.4 to 12.2 percent from 2004 to 2008. in the same period in Western Europe, production and sales had shrunk 11 percent and 6.2 percent, respectively, while the decrease in demand and market flooding made it apparent how far the built-up overcapacity had gone in the sector. in Japan, since the 1990s, the whole sector had been showing its limitations, while the real estate bubble sparked an uncontrollable recession and financial crisis that lasted the entire decade. Even when Toyota's persistent efforts to become number one paid off by 2007, surpassing GM in production, it came at a very high price. When the recalls of flawed and unsafe Toyota cars soared,2 it was clear that the Japanese were pushing the envelope too far, making the mythical lean production system break down. Nissan, Mitsubishi, Mazda, Suzuki, Subaru, and Isuzu, struggling between bankruptcy and declining demand, ended up being taken over by or allied with other players (Jetin, 2009; Stevens and Fujimoto, 2009). The speculative crisis that hit Southeast Asia first in 1997 forced korean hyundai to dismantle the giant group to survive. Early on, some authors stated that the investments coming to Mexico could slow, as the bailout would expose the Big Three to further political pressures. in other words, while drawing money from the public sphere to survive, it would not be politically correct for the Big Three to move it into cheap, offshore labor settings like Mexico. As Sturgeon et al. put it, "With the current severe recession in the united States, the Big Three at the brink of declaring bankruptcy, and many Japanese plants temporarily shut down to forestall the build-up of additional excess inventory, the future of planned and even existing investments in Mexico must be called into question" (2010).14 I show that events are unfolding quite differently. Most of the auto corporations working in Mexico neither cancelled their planned investments nor delayed their portfolio for future projects. Why and how did this happen? My thesis is straight -forward: most of the auto corporations, and especially the Big Three, are putting forward product and market strategies in the North American market that reaffirm Mexico's low costs and highly reliable platform for exports as strategic assets for both resolving the crisis and shielding their own market share in the whole region. Methodologically, I seek to obtain and provide information related to those variables of product policy based on on-going field work15 to prove that these firms' strategies include setting up a greater number of projects in Mexico, while the Big Three, by contrast, were simultaneously freezing or closing plants mostly in the U.S. This makes Mexico more relevant in the regional market. As part of this fieldwork, I carried out a first round of interviews with executives from Ford of Mexico and GM, as well as with public officials in charge of promoting the auto sector in Northern Mexico. Yet at this stage of my research, I am working primarily with information provided by firms' conference rooms and public data they refer me to. Data related to firms provided in the second part of this essay, unless otherwise indicated, come from these sources. The rest of the information I use is from databases, studies, and analysis carried out by specialized organizations and publications. The study is made up of four sections in addition to this introduction. in the first, I pull together basic data about the Mexican automotive industry to illustrate its evolution over the last few years and its resounding bounce back. in the second part, I analyze one by one the seven firms producing cars in the country, focusing on the productive and market strategies they implemented between 2008 and 2010. in the last two sections, I provide some discussion and recapitulate to develop some conclusions and theses for future research. 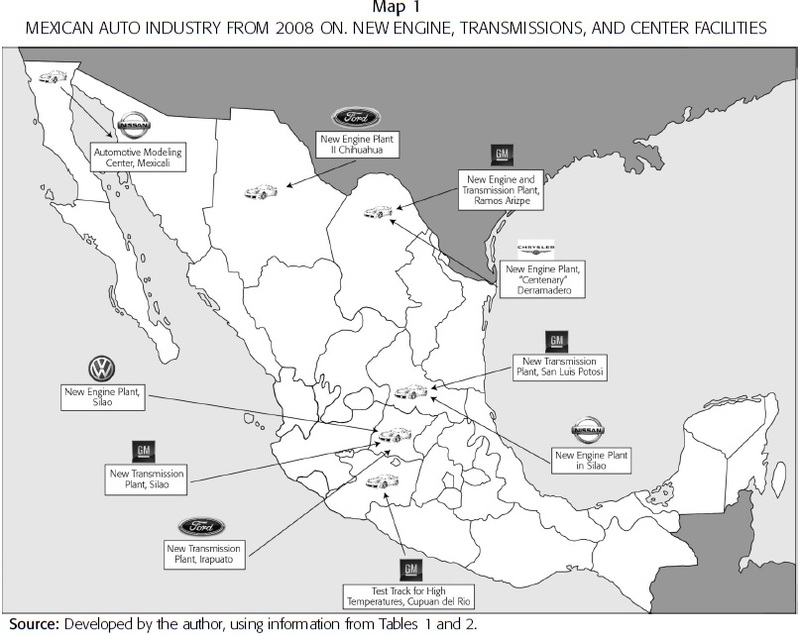 Automotive production has been organized regionally; yet, at the height of globalization, auto corporations emphasized regionalization strategies within distinctive regional production systems.16 A number of scholars have examined these trends (lung, van Tulder and Carrillo, 2004; De la Garza, 2006; 2010; Zapata, 1998; Carrillo, 1990; Carrillo, 1990, 2007; Carrillo and Contreras, 2008; Unger, 2010; Cardoso and Covarrubias, 2006; Bensusán and Sanchez, 2006; Freyssenet, Shimizu, and Volpato, 2003; Boyer and Freyssenet, 2002; Humphrey, Leclerc, and Salerno, 2000; Covarrubias, 2000, 2009; Arteaga, 1994; 2007). regional strategies are not new; rather, they have been a corporative approach to shape a "regiocentric" space, within and across borders, where productive and marketing strategies are to thrive and eventually prevail. in fact, as core scholars on multinationals' strategies have extensively shown, between ethnocentric and geocentric strategies lie regiocentric ones, while firms need an approach that fits global with local responsiveness, along with encouraging worldwide learning (Bartlett, Ghoshal, and Birkinshaw, 2003; Prahalad and hart, 2002). in brief, regionalization, which I translate into regiocentric strategies, means that firms determine geographical areas to arrange an integrative network of producers and suppliers aimed at gaining competitiveness and market governance within them. Regionalization in Mexico's automobile industry was more than evident in the 1990s. Auto production grew dramatically, driven by the place automakers gave the country as a reliable, low-cost frontier for deploying and replacing operations. The North American Free Trade Agreement (NAFTA), involving the U.S., Mexico, and Canada and which came into effect in 1994, further accelerated a regional production system by removing inter-regional duties and imposing higher barriers for outsiders. Between 1988 and 1998, auto output in Mexico increased by 130 percent, rising from 629 000 to 1 453 000 units.17 in 2000, production reached 1 889 486 units and even though four year later it decreased to 1.5 million, since then it has climbed steadily, setting historic records for the years 2007 and 2008, with 2 105 789, and 2 180 294 units, respectively. Then the crisis irrupted, decreasing output by 28.3 percent in 2009, as total production plummeted to 1 566 842 units. The rebound was quick and considerably stronger. At the end of 2010, production in Mexico reached 2 260 776 units,18 and for the current year most specialized forecasts indicate that it will beat all previous records. in short, what we have seen in these three years is that the crisis took a little longer to land in Mexico and, conversely, much less time to recover. It is more important to note that recovery has been as dramatic as the crisis, taking Mexican production of finished vehicles to new peaks. Such remarkable oscillations in auto output may well imply from the outset that the productive and market trajectory of automakers, and hence of the auto industry as a whole, has become more and more unpredictable. But it also means that, as we shall discuss in this essay, auto firms quickly upgraded Mexico as a critical asset for them to prevail within the North American region, while overcoming the crisis and shielding their own market share. Meanwhile, the Mexican domestic market remained weak and stagnant, increasingly import-oriented, with imports accounting for more than half of domestic sales. Sales in 2010 of both domestically-produced and imported light vehicles increased by 7.3 percent (equivalent to almost 810 000 units), and of heavy trucks, by 13 percent (close to 26 000 vehicles). However, compared to 2008, these figures were 21 percent and 45 percent lower, respectively. Moreover, the Mexican Association of Automobile Dealers is saying that if these "slow growth" trends continue in 2011 as indeed they are expected to national car sales will barely "be at similar levels to 2000 and [will] still be far from the results prior to the 2008 crisis" (AMDA, 2010). The domestic market is covered largely by compact cars. Nissan seized the largest share of the domestic market. in terms of makes, Nissan's Tsuru is the best seller in the Mexican market with a 7.6 percent share, followed by volkswagen's Jetta (4.8 percent) and the Tiida (4.0 percent); then come GM's Aveo (3.4 percent), VW's bora (3.1 percent), Nissan's Sentra (2.7 percent), the Chevy three-door GM (2.5 percent), the Nissan large chassis (2.3 percent), the Chevy four-door (1.9 percent), and the VW gol Sedan (with 1.8 percent of the market). At the beginning of the crisis Mexico manufactured for the regional market as many as 24 auto makes, 80 percent of them for export mainly to the U.S., of which GM, Ford and Chrysler accounted for 70 percent.19 The rest of the exports were divided among the other four automakers established in the country: Japan's Nissan, Toyota, and Honda, and the germany's volkswagen. Dominated by the American Big Three, their long history of gas-guzzling production of Suvs, LVCs, Minivans, recreational, sporty vehicles, and the like was reflected in Mexico:20 in the pre-crisis years, a large part of the production for export was made up of vehicles of the medium and large segments (Juárez Núñez, Lara Rivero, and Bueno Castellanos, 2005; CEPAL, 2010). As a result while the external market was largely crowded with medium and large cars produced domestically, the domestic market was largely packed with small cars produced both abroad and at home.21 What I will show is that since the crisis, most firms are turning to producing compact and subcompact cars in Mexico. The CEPAL (2010) described the state of the Mexican automotive industry as follows: it was made up of 20 assembly plants, 2 000 parts and components factories, and a network of more than 1 400 dealerships. At the end of 2008, it had one million formal jobs, representing 13.5 percent of industrial employment, 20 percent of manufacturing exports, 4 percent of GNP and 16 percent of manufacturing GNP. While GNP fell by 7 percent in 2009, the automobile sector contribution to GNP slipped to 2.7 percent and to 15 percent of manufacturing GNP. in the meantime plant closings and layoffs reduced the workforce by 10 percent.22 During the crisis, Nissan replaced GM as Mexico's foremost auto manufacturer, though it did not last long at the top. by 2010, GM had recovered the spot as the largest producer, followed closely by Nissan, VW, Ford, and Chrysler. Honda and Toyota ranked at the very bottom with a modest output of about 50 000 vehicles each. Now we turn to the product and market strategies of these seven automakers. • During the spring of 2008 Ford began work to build a new engine plant at its Chihuahua Complex, next to Plant II. getting ready for "Job one" in November 2009, the new facility is to produce the 6.7-liter Power Stroke V-8 turbo-charged diesel engine, using a power train design emphasizing fuel economy, purportedly the most advanced of its class. its goal is to offer the first diesel engine manufactured in North America for 2011 Super Duty F-250, F-350, F-450, and F-550 trucks.26 From Ford's perspective, this new plant would represent a corporative worldwide model for innovations, just as Hermosillo did with the CD3 project. With a US$838-million investment, the whole project will generate 1 100 direct jobs and 3 300 indirect jobs in its final stage, and have an annual capacity of producing 200 000 engines. • The opening of a new plant in Guanajuato to manufacture transmissions was another Ford milestone in 2010. It will produce the 6DCT250, employing 1 200 workers, with a yearly capacity of 350 000 units. The project, jointly developed with Getrag Company, has received an investment of US$500 million. • In Cuautitlán, Ford's oldest plant, the corporation proceeded to bring back to life a practically extinct brown-field factory.27 in a major operation costing US$1.2 billion, the plant was wholly retooled to manufacture a redesigned Ford Fiesta in the first quarter of 2010, aimed first at filling the North American market and then South America. It will debut as the Ford Fiesta 2011. The plant will work through a global platform and used designs based on the European "kinetic Design," bringing forth higher quality and reliability, increased performance, and fuel efficiency. It will have an annual capacity of up to 324 000 vehicles and employ 2 000 workers.28 its technical and social layout is expected to be one of the most advanced flexible manufacturing systems in the North American region. Constructed over an additional 25 800m2 to house the manufacturing process, its layout includes a line of five highly productive presses, 270 robots, online measurement systems, and ergonomic adjustable platforms in the area of seats. in the painting area, a new process was incorporated known as "Wet," which applies the primer, base paint, and transparent "on wet." in the stamping area, the retooling was complete, given that all major sub-assemblies and body system modules will be manufactured in the plant. Despite the fact that solely in 2008, it lost US$30.9 billion, as well as its spot as the premier company in sales after Toyota's most profitable fiscal year, GM's history in Mexico has been no different from Ford's. It seems to be striving to make clear the extent to which Mexico's operations are crucial to both defend its North American position and overcome the factors that brought it to the verge of bankruptcy. And like Ford, GM funneled a good deal of planned and new resources into the country. indeed, between 2006 and 2009 the firm invested US$2.8 billion and from 2010 to 2011, it estimates additional investments of US$1.2 billion. These resources are going to be used to open a new plant, the San Luis Complex, a Test Track for Extreme hot Weather, and to modernize and make new releases in the Ramos Arizpe Complex. in both complexes, plus the Silao one, GM opened up transmission plants. • In early 2007, in the municipality of villa de Reyes, 30 kilometers from the city of San Luis Potosí, GM began to build what will become what Kevin Williams, president and CEO of general Motors Mexico called "one of the most important GM factories worldwide... a reference factory for the rest of the world" (Expansión, 2008). The US$1 billion in investments created what has been come to be known as the "Cactus Project," which targeted making T250-Aveo models to compete in the sub-compact segment and offering GM's answers to fuel price hikes and demands for fuel efficiency. in some respects, after the San Luis complex, GM was replicating the Ford CD3 launch at HSAP. When exploring the options to set up this plant, San Luis Potosí took the lead for a number of reasons:34 the most important was its location in Central Mexico, near both the U.S. border and the greater Mexican markets, since the "Cactus Project" meant dual-purpose production to serve local and export markets, first in the U.S. and then South America. becoming the fourth GM complex in Mexico, the plant opened in July 2008, employing 2 000 workers, plus an estimated 10 000 to be employed by the 15 first- and second-tier supplier firms linked to it. Among these are Posco MPC, valeo Transmissions, lear, and Dong kwan. • The Aveo features korean technology, carrying a four-cylinder gasoline engine equipped with a standard 1.6-liter I-4 engine and standard 5-speed manual transmission, and a 5.7 liter/100 kilometer highway fuel consumption rating, all in turn based on GM-Dae Woo variable valve timing technology that supported "double continuous variable cam phasing" (DCVCP).35 Production capacity started at 75 000 units per year, a productivity of 31 units per hour with a single platform. but the plant is able to accommodate multiple platforms ranging from producing sub-compact to compact cars, for a total annual capacity of 360 000 units. its technical and organizational layout seeks to set standards for a highly flexible, technologically advanced factory, easily able to raise productivity to 52 cars per hour. • One year after the start-up of the San Luis Complex, it included a transmission plant with a US$400-million investment, a 300 000-unit capacity, and 600 workers. The plant will build automatic transmissions that can be used by all the compact cars of the GM range, incorporating four-speed for the front-wheel drive and four-wheel drive, gear shifts from clutch to clutch and advanced technology for more efficient fuel consumption. • GM poured its largest investment between 2006 and 2009 into the Ramos Arizpe, Coahuila, Complex: US$1.36 billion. of that, US$500 million ended up in the preparation of a production line to manufacture the hybrid version of the Captiva Suv, added to the other models manufactured in this assembly and stamping complex, namely the Chevrolet Chevy (all versions), Chevrolet Captiva Sport, HHR, and the Cadillac Srx. US$469 million went into a new engine plant that will produce the HVV6 3.5-liter/ HVV6 3.9-liter/HFV6 versions. The rest of the investment went into a new transmission plant to produce 6-speed FWD/2-mode hybrid/4l60E and heavy Duty 4l70E. For the two plants, new hires came to 875. • Furthermore, in August 2010, the company announced an additional investment of US$500 million for Ramos Arizpe. US$284 million will be for producing a new generation of eight-cylinder engine, and will directly employ 390 new workers. The remaining resources are earmarked for building a new platform to produce a new, as yet undisclosed vehicle, adding 400 jobs. At the Silao, Guanajuato, Complex, where the Chevrolet Avalanche, Chevrolet Silverado Crew Cab, Cadillac Escalade ExT, GMC Sierra Crew Cab, and Cheyenne Crew Cab are manufactured, GM disbursed US$660 million and hired 1 100 new workers to build another transmission plant with an annual capacity of 500 000 units for the 6l50/6l80 and 6l90 versions. Summing up capacities of the San Luis, Ramos Arizpe, and Silao plants, GM expects to produce one million transmissions a year. • Another US$50 million were invested to build a Test Track for high Temperature Conditions, located in Cupuan del rio, Michoacán. opened in 2008, it is intended to be the largest of its kind in latin America, equipped with a circular track, 4 testing lanes, safety rails, serpentine traffic track, city traffic track, gravel track, dust trail track, and "soak & idle" for climate static testing. It employs 134 workers. • By contrast, in the Toluca Complex, the company stopped producing the kodiak truck, leaving its production for the manufacture of l4 3.0l/l4 1.6l Family one/v8 5.0 and 5.7l engines, as well as cast blocks, heads, and crankshafts. Against all the odds, the most troubled U.S. automaker also made investments in Mexico over these years, trying to achieve greater leverage in the region.36 between January and July 2009, Chrysler's auto output in its U.S., Canadian, and Mexican plants combined plummeted to 353 536 units from 1 190 679 units produced in the same period in 2008. At the same time, in the united States, it closed more than 300 dealerships and, between 2008 and the first half of 2009, cut 30 000 jobs. The impacts of Chrysler's tribulations on Mexico were straightforward. in summer 2009, Chrysler of Mexico's production had fallen to less than half. Particularly in the Toluca Complex, technical stoppages affected the production of the PT Cruiser and the Journey. in 2010, developments became more critical, to the degree that the Cruiser was discontinued from the firm's portfolio; whereas at the Ramos Arizpe Complex in Derramadero, Coahuila, RAM truck output fell by 65 percent although in November 2010 the plant was operating again at 90 percent capacity, with 2 200 workers in two shifts. The fact is that Chrysler maintained its expansion and investment plans, although they were modest compared with those of the other U.S. giants. As Manuel Duarte and Dave Elshoff, Chrysler spokesmen for Mexico and the international community, respectively, stated, "While [the firm] closes plants in the U.S. and withdraws from other countries, it maintains its expectations in Mexico and in particular in Coahuila" (Zócalo Saltillo, 2009). • Two projects continued. one was a new engine plant in the Derramadero Complex, with an investment of US$570 million. Construction began in June 2007, and, after several delays and schedule adjustments, the new plant started up in october 2010. introduced as the Engine "Century Plant" by Chrysler,37 it will employ up to 700 workers to produce 440 000 units. It was also introduced as the first "green" plant in the Mexican automobile industry, since it will use solar power generated by 1 900 solar cells and thus avoid emitting up to 7 500 tons of CO2 a year. It will manufacture the Chrysler Pentastar v6 engine, a series of aluminum dual overhead cam24-valve V-6 engines introduced for model year 2011 to replace the seven different v6 engines currently used in the Chrysler Ram, Jeep, and Dodge product line. The engine will be assembled in 13 vehicles, including vans and Suvs, Challengers, Jeep grand Cherokees, Town & Countries, 300 and 200, and Dodge Chargers, Avengers, Durangos, and Journeys. It will provide fuel efficiency in an average range of 7 percent. • The second and most highlighted project arrived in early 2011 to inject new life into the Toluca Complex (originally it was planned to start operations in 2010). The firm is investing US$550 million to outfit a new production line to manufacture the sub-compact Fiat 500 Premium. It aims to reach an output of 100 000 units a year and create 500 direct jobs, in addition to the 2 000 that already existed, plus 3 000 indirect jobs. The Fiat 500 Premium will serve the U.S. market from 2011 on, and secondarily the South America one. Considering that Fiat has not introduced any car into the U.S. market for two decades, the 500 Premium is made to penetrate the small-compact segment of the market with a mini-car that is highly rated in Europe for both its stylish tradition and its fuel efficiency.39 Expecting a positive response from the U.S. market, Fiat/Chrysler has plans to turn out an electrical version of the 500 Premium in 2012. This way it will follow in the footsteps of the Nissan leaf, introduced in the U.S. at the end of 2010. While attempting to become the first car producer worldwide, and with the knowledge that such an attempt implies conquering the U.S. market, VW maintains Mexico as a key output-boot camp for deploying its regional strategies. indeed, VW has repeatedly voiced its aspirations of taking the lead from Toyota and GM in a few years.41 VW has made two main moves over these past three years in Mexico, both targeting increasing its clout using this country as a base. First, it is improving its capacity in Puebla. Second, it has definitely given up its long-standing Puebla-only production strategy by opening a new facility in Silao in the state of Guanajuato. • In 2008, volkswagen Puebla reached a record output, manufacturing 450 802 units; 19 months later, despite the turmoil brought about by the crisis, in July 2010, Puebla achieved the highest production of all plants in North America.42 This was a result of VW's commitment to investing and improving despite the crisis. by summer 2009, the firm confirmed it would be investing US$1 billion in Mexico to develop a new model (the sixth-generation Jetta) and to expand capacity with the construction of the West Segment Production Area.43 With this expansion, production capacity increased to half a million units annually. The project started in 2008 and was completed by summer 2010, hiring 2 000 additional workers. • In September 2010, VW revealed plans to grow outside Puebla "as a part of its strategy for long-term growth in North America" (Autoplaza.com.mx & Automovil, 2010). It will be pouring an estimated US$550 million into building an engine plant in Silao, Guanajuato,44 for an annual output of 330 000 units, and will be employing 700 workers. The engine represents a new generation of VW power-train systems for energy savings and producing fewer emissions. Scheduled to start up in 2013, it will supply the plants both in Puebla and Chattanooga, Tennessee.45 here it is worth noting that in 2011, Chattanooga will start producing a new midsize sedan like the Passat, specifically designed to compete with the Toyota Corolla in the U.S. market. According to VW executives, the firm will spend about US$4 billion on research and development for this model, along with expanding Puebla, building Silao, and preparing the launch of new models from Mexico (CNN Expansion, 2010). As noted elsewhere, when trying to gain market share in North America, Japanese automakers, with the exception of Nissan, put the bulk of their investment in the U.S. and only marginally in Mexico and Canada.46 This has been a crystal-clear tendency since the original "transplants" came to North America. I see no change in this tendency as yet, at least with regard to Mexico. Toyota and Honda kept their operations in Mexico at a minimum, whereas Nissan is constantly expanding it. •Toyota. This firm, which continues to be the world's foremost automaker, did nothing in Mexico but endure the crisis of recent years, afflicted as it has been with its financial, quality, and reliability challenges. in 2009, the Toyota plant in Tijuana experienced several "stoppages" to deal with the regional market slowdown. The plant closed the year barely producing over 40 000 units, compared to about 50 000 in 2008. by 2010, it went back to operating at 100 percent capacity, manufacturing over 50 000 Tacoma pick-ups for sale in the united States and Mexico.47 This is the single model and the original output capacity the Tijuana plant has had since 2004. It continued to employ about 800 direct workers and 376 indirect ones. •Honda. The second major Japanese automaker continued its operations in Mexico with caution. The only remarkable event I found over the last three years is that its plant in El Salto, Jalisco, went ahead with the plans it had formulated since 2007, that is, retooling to produce the crossover Honda Cr-v. Early on, Honda plan ned to take advantage of the shift in consumer preference to the segment of smaller, more efficient, fuel-saver crossovers. The El Salto plant had been producing the Honda Accord, with a modest capacity of 30 000 units a year, motorcycles, and parts for the Mexican market and secondarily for export. under the new plan, Honda invested US$200 million, raising productive capacity by two-thirds and increasing the work force from 1 400 to 2 100. The plant was retooled to produce 50 000 CR-Vs from 2008 on, with an i-VTEC 2.0-liter, 166 hp motor at 6200 rpm, a top speed of 116 mph and 0 to 60 mph in 10.3 seconds. Honda aimed at selling half its units in Mexico and the rest in the U.S. and latin American markets.48 The latest data confirm that predictions were accurate. in 2009, production reached 48 000 units and a year later they exceeded their capacity, producing over 50 000 units in two shifts, 80 percent of them for export. •Nissan. Nissan has been very active in recent years. It reaffirmed its position in the Mexican market, to the point of taking the lead in sales; invested US$1.1 billion to launch the new Micra in Aguascalientes; expanded its capacities; and built an Engineering Design Center in Baja California. Furthermore, in May 2011, Nissan won New York's "Taxi of Tomorrow" competition with the Nissan Nv200, taking on an exclusive 10-year contract worth US$1.1 billion to provide all 13 000 yellow cabs in the city. The point is that these cars will be built in Mexico. likewise, Nissan signed an agreement with the Mexico City government to introduce the electric leaf in the capital. in 2008, it produced 450 000 units for the domestic and export markets; 212 000 vehicles were sold in Mexico, garnering the company a market share of 20.7 percent. None of its industrial complexes laid off workers during the crisis; rather, there just were some stoppages.49Although in 2009 total output fell to 355 414 units, at the end of 2010 it soared, exceeding 500 000 units, placing Nissan second only to GM. Nissan reaffirmed its leadership in domestic sales with as much as a 24-percent market share, however. At the same time it exported to 75 countries. • In 2011 the company will introduce the fully electric leaf ("leading, Environmentally Friendly, Affordable, Family car") and the Juke in Mexico.50 The leaf comes first to Mexico City as a part of an agreement signed with the local government to advance the "green Strategy" program: the company will introduce 500 leafs, while the government builds electrical power stations for recharging them. They will be used either as taxies or for public service, before Nissan will sell them to private citizens next year (Autoplaza.com.mx & Automovil, 2009). • In the middle of 2010 Nissan announced a US$600-million investment to produce the new Micra-March in Aguascalientes, which will enter the market in the first quarter of 2011. It will be based on the v-platform, meant to reduce weight and the number of components in a given small model, decreasing emissions and increasing fuel efficiency.51 The MicraMarch X02A, which will also be produced in india and Thailand, target the emerging markets of China, Africa, India, and Mexico. reports indicate that at an early stage, the plant will have an output of 50 000 units, 30 percent for the Mexican market and the rest for latin American markets, mostly brazil (MilenioOnline, 2011). When the crisis broke out, some scholars believed that automakers' investments in Mexico might be called into question. This would be more applicable to the Big Three provided they were receiving federal loans to help them avoid bankruptcy. I find no evidence supporting this contention, however. To the contrary, what I found is that during these years, automakers have been investing more resources than ever in Mexico. indeed, neither economic hardships nor political pressures, if any, stop ped the flow of auto money into the Mexican auto industry. Summing up firms' planned and future investment, the country has received more than US$13 billion during these few years, creating more than 17 000 new jobs. 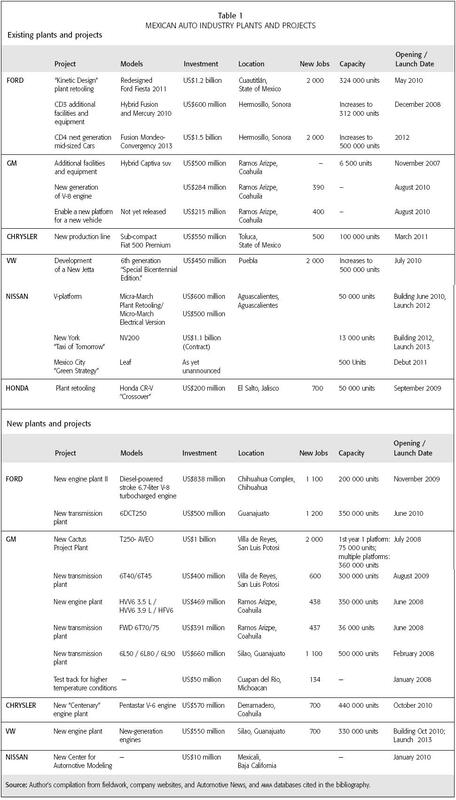 Moreover, the American Big Three alone have spent about US$9 billion, opening up three new engine and four transmission plants as well as one new assembly plant, accounting for more than 80 percent of new hires (see Table 1). Simply put, when it comes to fighting for survival and remaining competitive, automakers set aside any political premise and put business first that is, it's business as usual.54 That is the lesson of these years coming out of Mexico; and this is why Mexico's auto industry not only rapidly dodged the crisis when it exploded in 2008 but recovered growth spectacularly, receiving investments and developing old and new projects as never before. A somewhat related story is now developing. As of May 2011, the mayor of New York has been dodging a mass of acrimonious criticisms because the city granted the "Taxi of Tomorrow" project to Nissan, to be manufactured by a Mexican plant.55 I think this is happening because Mexico's low costs and highly reliable platform for exports, along with its embedded and proven networks of suppliers built over the last two decades, have turned into a more valuable asset for auto firms defending their shares in the North American region. Added to this, the market is to a great extent moving down the ladder to more economic, fuel efficient cars, the segments the Mexican industry is again re-oriented to, due to both soaring gas prices and environmental concerns. Automakers are all strongly compelled to rapidly design and innovate more efficient vehicles, be they hybrid, electric, or any other kind of alternative displacement system. Yet, today's demand for more efficient vehicles will not be satisfied with just any kind of efficiency. The market calls for complex efficiency, adding new energy and emissions savings requirements to the pre-existing demand for higher quality, security, and consumer-tailored iT features. And that is not all. They also entail plain consumer maximizers: most people also want to pay less for more. Firms are at the crossroads of these pressure lines, fighting each other to set a new dominant pattern for making and selling vehicles that best meet all these demands. Needless to say, only the winners will survive. Additionally, long-established automakers are further threatened by competition from new aggressive players from the BRICs.57At the same time, many independent entrepreneurs, engineering and design newcomers, and the like are running their own hectic race for developing alternative displacement systems, including electric ones. Any of them could win the race at any time, or end up making the difference by being absorbed by non-traditional, non-Western auto manufacturers (MacDuffie, 2010). in the end, existing firms and newcomers are all imposing a frantic pace: innovating, developing, testing, replacing, and launching new products. As a result the room for making mistakes has broadened.58 The Mexican auto sector's greater region-centric importance is further nurtured by these firms' dilemmas, lending more weight to integrated regional production systems and strategic value chains working inside them. And since home regions have been the main and safest basis for achieving market share and deploying profitable strategies (Jetin, 2009), firms are learning the hard way how critical it is to achieve and maintain governance there. Here, a few notes of caution might be useful. in a certain way, the large amount of new projects coming to Mexico parallels the outsized flow of auto investment that in the late 1990s went to South America and Central and Eastern Europe. Yes, it is true that such flows had a quite different goal compared with Mexico's today. back then they were looking for the "newly affluent" consumer of these emerging economies to compensate for the stagnant demand in the mature economies' saturated markets, while the investment projects landing today in Mexico are looking chiefly to the U.S. market. Yet, as auto firms miscalculated local market capacity when going south and east a decade ago and most of their plans collapsed when the speculative bubble and the crisis of "confidence" broke out, they may be miscalculating again, but this time in relation to the capacity of the U.S. market. On the other hand, few auto corporations are currently in such complex and dire straits and subject to mounting pressure and scrutiny as the U.S. ones, which continue to pull along the bulk of the Mexican auto industry. indeed, their own trajectory of bad decisions continues. For instance, U.S. automakers and government still blame each other for the gas-guzzling production history they raked up with the Suvs-LVCs-sports-vehicles-and-the-like mania. Even in the new century, they kept on doing largely the same thing without noticing that the speculative bubbles, the crisis following 9/11, and skyrocketing oil prices were affecting the auto market decisively all through the decade. It was as though they were practicing the old, anarchic garbage can model of decision making, where they were tied to competing scenarios, problematic preferences, ambiguous solutions, untamed technologies, limited resources, and the traditional back and forth of policy makers without being able to make anything but opportunistic, seat-of-their-pants decisions.59 it was necessary to pile up their persistent market-share loss financial problems to the point of insolvency and add the 2008 credit crunch to force them to react. So, it seems that the Big Three were badly in need of a big-bang push to react. And then it just came from outside with the government bailout. however, the fact itself that two governments with different political affiliations proceeded at once to rescue them from bankruptcy illustrated quite well the nature of their organizations. That is, as instrumented, the bailout exhibited not only how symbolically important the Big Three are for U.S. capitalism, but also how their very existence has been institutionalized. As such, it implies that their very existence lies not only in their own hands, but also in the government's, which was able to use it as a ritual to gain legitimacy.60 Thus, as their history unfolds, the Big Three are showing how they may be organizations fighting merely for survival, putting aside the alleged efficiency organizations like theirs are supposedly pursuing. One last remark. boyer and Freyssenet (2002) and Freyssenet (2009) have shown that over the last decades auto firms have followed a host of trends and strategies hoping to catch up with each other: lean production, globalization, cost-cutting, new-economy approach, externalization, modularization, innovation, communalization, merger-mania (concentration), delocalization, global sourcing, etc. Most of them or all of them, according to these authorshave been wrong in the end. Most of them have been recommended by scholars and consulting firms alike as the very best practices to achieve competitiveness, make profits, and beat out their rivals. In the Americas, lean production was bandied about disproportionately from the 1980s to the 1990s and in many instances, beyond. While the lean production myth was being dismantled by its own creator, Toyota,61 throughout the last decade, in latin America a number of scholars and practitioners have continued studying and making suggestions for local firms and governments to reach "innovative lean production practices and systems." Now that Mexico has taken on greater importance in the North American region, it is imperative to develop more robust and cautious studies, forecasts, and policy recommendations that go beyond the fads that organizations and scholars like to imitate everywhere. This is a turning point for traditional large auto corporations. Firms are at the crossroads of a number of mounting pressures, emerging from the search for a new dominant, more efficient pattern for transporting people, as well as for making vehicles that best meet the demands for higher quality, safety, IT equipment, full savings, and dealing with climate change and carbon emissions. Additionally they have to figure out the challenges posed by the new geography for making and selling vehicles and the threatening presence of new players from the BRICs. Amidst these mounting dilemmas facing firms to be able to thrive by overcoming the crisis and the need to recover and defend positions at home, Mexico has been grabbing this time literally some of the plants and jobs lost in the U.S., and hence acquiring more importance in the regional market. The market is currently focusing on compact and sub-compact cars, precisely allowing Mexico to recapture and relaunch its auto industry, given its ability to churn them out, along with its more recently developed capacity to manufacture medium-sized hybrid vehicles. • They are launching from Mexico a set of brand new projects. As Ford did with the CD3 Project from 2005 on and is now doing with its successor , the CD4, today Chrysler, GM, VW, and Nissan are launching brand new projects from Mexico, namely the Premium Fiat 500, the Cactus/Aveo, the New Jetta/ Post-New beetle, and the Micra-March, respectively. • They are all redirecting investment into Mexico with a broader approach to deal with the demand for more economic, fuel-efficient cars by opening up a number of new engine and transmission plants to supplement power-train systems with features the market is now demanding. Therefore, while retooling and expanding old facilities and opening new ones, from assembly to engine to transmission plants, they are pulling together a network of complementarities and value chains to serve the medium and lower segments of more eco-friendly vehicles in North America. a) The Northern border region, from Baja California to Sonora, Chihuahua, and Coahuila, which have acquired three new engine plants, one transmissions factory, and a technological development center. As for assembly plants, Hermosillo and Ramos Arizpe grew their capacities with new launching platforms. b) The Northern Central region, which dates back to 1982, when Nissan started up operations in its Aguascalientes Complex. From 2008 on, it has extended to San Luis Potosi by including GM's Cactus Project and, recently, a brand new transmissions plant. c) The Southern Central region, the country's oldest,64 which was reborn with the renewed Ford Fiesta at Cuautitlán, the retooling of Nissan's CIVAC Complex in Morelos for producing lower-emission cars, and the launching of the Premium 500 at Chrysler's Toluca Complex. d) The Eastern region, which has revolved around VW Puebla since 1954 and has now expanded to produce the renew Jetta and the Post-beetle. e) The Bajío region, Mexico's newest, which goes back to 1992 when GM arrived in Silao, Guanajuato, and then Honda in El Salto, Jalisco. At present, it includes a transmission plant and an engine factory in Silao, an engine plant in Irapuato, and a development center in Michoacán. In this renewed territorial reconfiguration, a special mix of work settings is developing, as brown-field worksites become green ones (i.e., Cuautitlán and Toluca), green-field worksites become old (i.e., Hermosillo, Chihuahua, and Ramos Arizpe), and brand new green-field worksites are added to the sector (i.e., San Luis Potosi). Some of these former green-fields are gaining new prospects by adding plants or projects, creating overlapping labor markets and employment relations structures (for example, Hermosillo and Silao),65 whereas on the opposite extreme, there are worksites that despite aging and being restructured either remain dominantly brown-fields (such as Puebla), green-fields (such as El Salto), or something in between (such as Aguascalientes and Morelos). All these last issues are beyond the scope of this essay and deserve specific studies. That is, it is very likely that labor markets and employment relations are experiencing different degrees of adjustments under such territorial reconfigurations, along with the different "firms' governance compromises" they imply. Specialized research will do a good job of analyzing these adjustments along with the specific productive models and governance compromises being created by each firm's product and market strategy. All in all, these are the reasons that explain how and why the Mexican auto industry has performed the way it has over the last three years, namely declining for a while and then dramatically bouncing back. Taking on more region-centric importance, the Mexican auto industry has gained nothing but greater market exposure. The problem is two-fold. First, the whole industry, the market, and the firms together are on a more unpredictable road, as most of us frequently recall. Second, the problem escalates because auto corporations are complex organizations whose strategic choices are anything but optimal, as we sometimes forget. Even when these firms attempt to work from a knowledge-based approach, at the end of the day, they are flat organizations with goals to set, strategies to pursue, and extraordinarily limited resources in rationality and efficiency terms to accomplish both. because of this, the trajectory of most auto corporations is full of wrong choices. Scholars will do better by studying and learning more from such experiences. Throughout this first round of the current time of crisis, the investment entering Mexico has not been stopped by politics or other externalities. Yet nothing can insure that it will be flowing like that in the near future and subsequent rounds. This particularly holds true for an auto sector like Mexico's, which is based on no industrial policy other than capturing all possible FDI, offering solely lower costs, and platforms for export. Nowadays, the U.S. market and firms' strategies are driven by the political rules the bailout brought with it. This may be for the best. Yet the only thing that we be sure of is that, presently, automakers' transaction costs, uncertainty, margin of error, and opportunism in their principal/agent relationships, along with the pressure to produce more efficient cars with alternative energies and driving modes, amidst a host of aggressive new players, are all increasing. * This research has been supported by the Conacyt Mexico Scholarship Program for Sabbatical and PostDoctoral Work Abroad. 1 More than US$100 billion between 2005 and 2008 (Stanford, 2010). 2 From 970 000 units in 2003 to 1 098 000 units in the first half of 2006 (Shimizu, 2009). 3 Freyssenet's seminal work postulates that all this is setting up the threshold of the "second automobile revolution" (2009), that is, a radical industrial movement that will come to replace the internal combustion engine as a dominant industrial paradigm with new eco-friendly displacement systems. 4 As is well known, four years earlier China was not even producing half the number of vehicles produced in the U.S. (INEGI, 2010). 5 At the beginning of 2011, the China Association of Automobile Manufacturers (CAAM) underscored the way the country had taken the lead worldwide. in a press conference, the CAAM stated that "China had produced 18.26 million automobiles and sold 18.06 million in 2010, up 32.44 percent and 32.37 percent from 2009 to 2010" (China Economic Net, n.d.). in the U.S, by comparison, sales closed at 11.6 million, an increase of 11 percent over 2009. As seen, China had no problem in overcoming the car sales record set by the U.S. in 2000. back then it sold 17.4 million units. in this scenario, in 2011 China will easily be marketing more than 19 million vehicles. See NADA (2011a and 2011b), Automotive News (2010a, 2010b, and 2010c), J.D. Power and Associates (2010a, 2010b, and 2010c), and Automotive Business Review (2010). 6 I will document here this recovery and rebound. Alvarez et al. (2010) pointed out early on the rapid recovery of auto production in Mexico. For an analysis of the policies implemented by the Mexican government to support the industry during the crisis, see Lacayo (2010). 7 Ford was able to avoid the bailout despite its huge debt, but even so, the collapse of GM and Chrysler would have sealed its own debacle, so it promoted the bailout overall. This established how extraordinarily inter-dependent the North American automotive industry has become within and across its whole chain i.e., from producers to suppliers, from distributors to consumers, etc. The bailout, an unprecedented financial intervention in the billions, was a "matter of state" to the Obama administration, since a collapse of the "Big Three" would have meant the failure of some of the most emblematic firms of U.S. capitalism and jeopardized the 1.6 million jobs directly linked to the industry. For an insider view of the bailout, see rattner (2010), written by the first head of the Presidential Task Force on the Auto industry Obama created. 8 Obama announced the final bailout plan on March 30, 2009. The transfer of resources was the greatest in the auto industry's history, lending US$60 billion to GM and Chrysler. If we take into account the US$17.4 billion granted as emergency loans by the Bush administration, plus the resources directed to the sector's financial institutions, the bailout came to as much as US$85 billion (CNNExpansión, 2009; The News- Herald, 2008). 9 This authentic "recall crisis" encompassing more than 10 million vehicles severely damaged consumer confidence in the firm, one of Toyota's greatest assets along with its alleged quality and reliability standards. Consumer Reports revealed that in the past two years, confidence ratings in Toyota were down 46 points, while Ford's rose 35 points (Consumerreports.org, n.d.). Product recalls, consumer claims, and replacements caused Toyota to end 2010 as the only major firm suffering a drop in sales while the industry as a whole climbed 10 percent. 10 Indeed, the questions mount. A second set of further questions are: who will rule the auto world of the future? Which technological trajectories, global and regional alliances, productive chains, and markets will leading firms target? Which social systems of production and employment relations will prove more enduring in the end? Will we witness in the coming few years a second automobile revolution led by more sustainable displacement systems? 11 The name of the research project is "The reconfiguration of Social Systems of Production and Employment Relations in North America's Auto industry: implications for Mexico." 12 That is, the three U.S. firms, Germany's VW, and Japan's Toyota, Honda, and Nissan. No new corporation has set up any assembly or stamping plants in Mexico since 2004, when Toyota launched operations in Baja California. back in 2007, First Auto Works, one of China's largest eautomakers, was set to open a factory in Michoacán, Mexico, as a joint venture with either of its main partners with strength in the region, GM or VW. Actually the only agreement signed by FAW for Mexico was with the grupo Salinas (one of Mexico's largest entertainment industry firms) to introduce the compact-extra-economical xiali and vita. The Salinas Group would sell the Xialis in Mexico through its Elektra popular outlet stores, a national chain of household electrical appliance retailers. The agreement faded in summer 2009, while FAW withdrew from its chief commitment, namely that it would set up a factory in Mexico with a minimum investment of US$100 million and an output of 50 000 cars in accordance with the Mexican Auto Law, which demands these requirements from a foreign firm from the North American region to import finished vehicles. It seems that FAW abandoned its plans for coming to Latin America, afraid of landing in the middle of the crisis. See ConsumerReports.org, (n.d.). 13 For a profit strategy to be successful, a company "governance compromise" must be achieved among the firm's main stakeholders, and it must fit the political and economic environment (growth mode) prevailing at the macro level (boyer and Freyssenet, 2002: 18-21). of course, profit strategies, productive models, and growth modes need an entire research program to study them as critical building blocks of a given sector. our research project plans to fill out some of these building blocks step by step in the regional auto industry. 14 And they conclude, "For General Motors and Chrysler especially, which have accepted federal loans, and even for Ford, which has not yet accepted any bailout money but may well be forced to do so, investing further in Mexico may be a political impossibility for some time" (Sturgeon et al., 2010: 18). 15 At this stage of my research, I am not able to provide evidence for all of these variables. In particular, I have no information as to margins. However, I will cover most of them in most of the cases presented. 16 Globalization opened up regional production systems to a number of dense value chains of interconnected linkages "consisting of flows of intermediate goods, information and instructions, and finance" (Sturgeon et al., 2010: 12). 18 The collapse of auto output was more dramatic during the first half of 2009, when the first half report registered a 42-percent drop in production. 19 Sales of finished vehicles and auto parts to foreign markets totaled around US$46 billion (INEGI, 2010). 20 American automakers took this to the point of making SUVs, LVCs, minivans, recreational, and sporty vehicles as their main source for profit and market share. indeed, from the 1990s and the first years of the new century the Big Three drew heavily on these high consumption/high emission vehicles to stay profitable, with light trucks accounting for 50 percent of the market at some point (Freyssenet, 2009). 21 By 1994, 75 percent of total Mexican output corresponded to compact cars. From then on, and particularly during the first half of the next decade, the production of light commercial vehicles grew, reaching its peak between 2002 and 2005, when it came to as much as 44 percent of total output (CEPAL, 2010). 22 Accounts differ about this. According to INEGI data (2010), motor vehicle manufacturers eliminated about 35 000 jobs between 2008 and 2009. But some studies show much more severe impacts. Samaniego (2009) points out that the whole sector lost 82 000 jobs in 2008. 23 It includes four areas: "product development, investment and development in manufacturing, effects and affects in the consumer experience, and social responsibility" (Ford Motor Company, n.d.). 24 Consuming up to US$1.3 billion, the CD3 project implied that HSAP would become a launch facility for a brand new vehicle in the segment of medium-sized cars, contrary to what the plant had been from the very beginning, that is, a plant to assembly compact cars, previously manufactured and consolidated elsewhere. To make it clear that HSAP signaled Ford's commitment to manufacturing more fuel-efficient and technologically advanced cars, yielding 17 kilometers per gallon, the Fusion and the Lincoln were designed to start filling the hybrid car segment and compete in it. The CD3 project also put into place a whole modular production system for the first time in the firm's history, and built a new complex for suppliers connected to the plant by three tunnels. It is made up of 14 facilities, housing 19 suppliers that synchronically deliver sub-assemblies and modules directly to HSAP assembly lines. See Covarrubias (2006). 25 In a March 2011 interview, one Ford executive confirmed to me that the work had begun for landing the CD4 project in Hermosillo. 26 The Chihuahua Complex, established in 1983, includes the engine plants I and II. As part of a profound reorganization for the new project, Engine Plant I, the first of the complex, kept the production of the "Duratec" I-4 (2.0- and 2.5-liter gasoline) for the Ford Escape, Ford Fusion, Ford EcoSport, and Mercury Milan, among others, within an installed capacity of 428 000 engines annually. Engine Plant II, which assembles engines under the "Zetec" project, was further reconfigured to also house the new diesel engine lines. 27 Over four decades of operations, Ford Cuautitlán (1964) has produced engines, mono-blocks, and a variety of vehicles like the Mustang, Cougar, Ikon, Thunderbird, LTD, Crown Victoria, Grand Marquis, Taurus, Mystique, Contour, and F and F-600 Series light and medium trucks, among others. By the end of 2008, more than 2.2 million units had come off its assembly lines. 28 In 2010, the first year of production, it was expected to reach 180 000 units. 29 The Ford Fusion and the Mercury Milan have been consistently granted the North American President's Quality Award, and Consumer Reports has recognized them as the most efficient vehicles in North America and tagged them as "best buy," including the Lincoln MKZ (Ford, 2011; Consumer Reports, 2009). 30 At the same time, at the end of 2010, Ford announced that was closing down production of the Mercury, a move revealing its preparation for the coming CD4, and the jettisoning of less profitable, gas guzzler brand names, no matter how emblematic they are. 31 Based on a modified version of the EUCD platform, the CD4 is also Ford's response to its decreased stake in Mazda, since the CD3 platform derived from the Mazda 6 sedan. 32 So that the CD4 will lead to a significant improvement over the current car's 35-mph highway rating and can be also placed in the next Focus and Ford Fiesta (Motor Trend, 2009a). 33 In this respect, it should be noted that in 2010 HSAP produced about 312 000 units, 80 000 more than in 2009, a record for its 24 years of operation based on the manufacture of 54 cars per hour. 34 Back in 2005, GM had made the decision to build a complex of this magnitude. According to GM executives, Mexico became a natural choice given its key role in the North American region. San Luis Potosí quickly emerged as "the best option" when local and federal governments contributed around US$100 million to provide land, a power station, inter-modal transport infrastructure, and a railroad connection, among other items. Additionally, the local government offered a first-year tax exemption (CNNExpansión, 2008). 35 As is well-known, GM allied with the former Daewoo Group following its bankruptcy back in 1999. On January 20, 2011, General Motors announced that GM Daewoo would be renamed GM Korea Co. (General Motors, n.d.). 36 In order to survive and as a part of the bailout, Chrysler made critical moves and forged different kinds of alliances with the United Auto Workers (UAW) and the governments of the U.S. and Canada. Later, in early 2009, Chrysler and Fiat signed a global strategic alliance whereby the latter will own a 20-percent stake in the company, which can grow to as much as 35 percent. After this arrangement, the UAW Retiree Medical Benefits Trust owned 55 percent of the new Chrysler group, and the rest was split between the U.S. Treasury and the Canadian Government, at 8 percent and 2 percent, respectively (The Wall Street Journal, 2009). on Chrysler's tribulations and its uncertain future, see MacDuffie (2010). 37 It was named after the centennial of the Mexican Revolution. 38 This was another of the critical moves made by Chrysler to come through the crisis. That is, making arrangements for shared production and assembly with Nissan and Volkswagen for trucks and mini-vans, respectively. 39 The Fiat 500 Premium features the FIRE engine (fully integrated robotized engine), a multi-air 1.4-liter power train that is more eco-friendly. 40 Back then the Toluca industrial Park had a US$1-billion investment distributed between the expansion of the Chrysler plant and eight suppliers, among others, TRW, Hella Behr Plastic Omnium (HBPO), Android, Brose, IPO, Intier, and Seglo. Initially, its goal was to produce the Journey crossover, with an annual capacity of 200 000 units, employing 1 600 workers. 41 VW aims to surpass GM and Toyota by 2018, a goal aired elsewhere (among others, quoted in the german financial journal Handelsblatt (El Universal, 2010). regarding some recent developments, it seems to be on the right track. For instance, last year VW reported the highest net margin among the five largest carmakers, at 5.4 percent, according to bloomberg data, followed by Ford (5.1 percent), GM (4.6 percent), and Toyota (2.5 percent net margin) (Automotive News, 2011b). 42 Automotive News (2011a) listed the 10 most productive plants in North America, ranking VW Puebla in first place because of its 42 400 units manufactured in July 2010, above other highly ranked plants, such as GM, Toyota, Hyundai, Honda, and Ford in the U.S. and Nissan in Aguascalientes, Mexico. 43 From the new production area came the New Jetta, in Mexico called the "Special Bicentennial Edition." Puebla's production is rounded out by the Golf, Bora, SportWagen, and New Beetle. Additional as yet unspecified investments will be used to set up the continuance of the New Beetle in 2011. 44 It will be located in the "Puerto Interior" Industrial Park, where VW is building this 60-acre facility. 45 The Chattanooga plant was the first step VW took to end its Mexico-only production strategy (Sturgeon et al., 2010). With the Chattanooga Passat, the Touareg TDI, highly rated by magazines like Car, and the New Jetta (rated as "green car of the year" by Green Car Magazine), VW plans to gain a greater share of the American market. As a reference point we can consider that in 2009 VW sold in the U.S. market 300 000 cars. This represented a market share of 2.9 percent, significantly below the 11.3 percent average reaped by VW in the world and truly far from the 17 percent grabbed by Toyota in the U.S. (Car, The World's Best Car Magazine, 2010; volkswagon Media Services, 2010; Green Car Journal, 2008; CNNExpansión, 2010). 46 Sturgeon et al, 2010. For recent developments of some of the Japanese in the U.S. market, see Huelsemann (2011); Byosiere and Luethge (2010). 47 As previously noted, this is the minimum that foreign firms must produce in Mexico according to the Mexican Auto law. 48 The expansion also helped boost auto parts production, which reached 1 million injected plastic parts and 1.4 million die-cast metal parts. It also supported starting up production of the "big red," a small displacement unit used in agriculture, camping, and hunting in the U.S. and other developed countries. 49 The Aguascalientes Complex kept running with a payroll of 6 000 workers, manufacturing the Sentra and Versa (Tiida) models for export. The components plant continued the production of the QR 2.5-liter series for the Sentra SE-R and the MR 1.8-liter and 2.0-liter series for the Tiida (Versa in the U.S. and Canada). They are exported to 60 countries, in addition to supplying the domestic market. The complex also continued assembling transmissions for D22 and Tsuru trucks, as well as the engines for both vehicles and the current Tsuru (b13). The CIVAC Complex in Cuernavaca did the same, with 1 700 workers on the payroll, producing the Tsuru, Tiida, and NP300 trucks for the local market. 50 The highly publicized electric car just began to be introduced in Japan and the U.S. at the end of 2010. Powered by lithium ion batteries for zero gas and emissions, it features a range of 117 kilometers with an energy consumption of 765 kJ/km (34kWh per 100 miles) and a combined fuel economy of 99 miles per gallon gasoline equivalent. 51 The V-platform models will have 18 percent fewer parts, a dashboard with only 28 parts instead of 56, and seats with 50 parts, down from 85. It will support cars weighing up to 1 600 kg and with a maximum torque output of 148lb ft. Most V-platform cars will be powered by three-cylinder engines, which will come in 0.9- and 1.2-liter capacities (Motor Trend, 2009b). 52 The story unfolding around these "Tomorrow Taxies" has been and will be interesting. in the competition, Nissan beat Ford's Crown Victoria and Karsan-Turkish Company, which planned to set up a plant in New York as a part of its proposal, sparking bitter complaints against Mayor M.r. bloomberg. The fact is that Nissan won with the NV 200, a minivan previously built for Asian and European markets, tailored for New York's taxi environment. It features power outlets to plug in phones and laptops; a transparent roof; exterior lights that warn cyclists and pedestrians about opening doors; custom climate controls for each seat; and sliding doors to prevent "dooring" of cyclists and passing cars, among other items (Grynbaum, 2011). 53 According to the firm, the Mexican Development Center is Nissan's third largest in the world. It concentrates on technologies for improving quality, safety, and comfort; reducing emissions; and increasing fuel efficiency. 54 This was not surprising at all; yet what was unforeseen was that corporations had no problem handling the federal loans the way they did. 55 Mayor Bloomberg's words were revealing when he stressed they were picking the best alternative: "...looks romantic to me ... what can you do?" (Grybaum, 2011). 56 Klier and Rubenstein expand on this, writing, "The plant closures left the Detroit three with 15 U.S. assembly plants in auto alley and only 4 elsewhere. By the end of 2010, both the east and west coasts were empty of assembly plants (30 years ago they were home to 12 plants). Within the U.S., the Detroit 3 had shrunk considerably during the last three decades. In 2010, they were operating final assembly plants in only eight states, compared to 19 in 1980" (2011: 14). 57 The Indian Tata and the Chinese Geely are two illustrative cases. In 2008, Tata made headlines by acquiring Jaguar-Land Rover; it was not the first time and it will not be the last. Four years before, it bought Daewoo and next partnered to take stakes in Spain's Hispano Carroceria and Brazil's Marcopolo. Recently, in 2010, it took over Italian Trilix (Wells, 2010). As for Geely, in 2010 it bought Volvo from Ford, after having done a joint venture with London Taxis, and then it took over the Australian Drivetrain Systems, which was bankrupted. So, both cases represent "a consistent strategy of asset-seeking acquisitions" (Balcet, Richet, and Wuang, 2011). 58 This explains the avalanche of recalls of defective new cars that a number of firms are experiencing, starting with Toyota. 59 For the garbage can model, see Cohen, March, and Olsen, (1972). 60 Had one of the original founders of Chrysler or GM had the opportunity to choose between being bankrupted and taken over, or bailed out, it is likely she/he would pick the former. 61 On the myth and misunderstandings about lean production and Toyota systems, see Pardi (2010, 2011). 62 In this last case, Fiat is already taking the group's R&D activities back to Turin, Italy. 63 Since the first Japanese "transplants" came to the U.S. back in the 1980s, it was apparent that politics was behind their decision to work America from the inside (Kenney and Florida, 1993; Sturgeon et al., 2010). 64 Remember that the Mexican auto industry was born back in 1932 in this region, when Ford arrived in Cuautitlán, and became a vibrant regional center in the late 1960s when Nissan launched in Morelos and Chrysler in Toluca. 65 On the overlapping labor structures and employment relations taking place at Ford Hermosillo, see Covarrubias (2009).